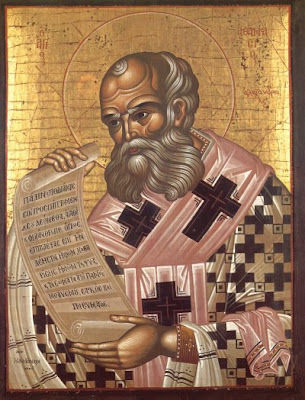 "To praise Athanasius is to praise virtue... To speak of and admire him fully, would perhaps be too long a task for the present purpose of my discourse, and would take the form of a history rather than of a panegyric: a history which it has been the object of my desires to commit to writing for the pleasure and instruction of posterity, as he himself wrote the life of the divine Anthony, and set forth, in the form of a narrative, the laws of the monastic life. Accordingly, after entering into a few of the many details of his history, such as memory suggests at the moment as most noteworthy, in order both to satisfy my own longing and fulfil the duty which befits the festival, we will leave the many others to those who know them. For indeed, it is neither pious nor safe, while the lives of the ungodly are honoured by recollection, to pass by in silence those who have lived piously, especially in a city which could hardly be saved by many examples of virtue, making sport, as it does, of Divine things, no less than of the horse-race and the theatre." Read the entire Panegyric to St. Athanasius here.